USGS Release: The Chemistry of Waters that Follow from Fracking: A Case Study (5/11/2015 8:49:26 AM). USGS Release: Historical Hydraulic Fracturing Trends and Data Unveiled in New USGS Publications (1/27/2015 12:35:41 PM). New Research: USGS In-Depth Study of Fracking from 1947-2010 | Marcellus Drilling News. USGS Scientific Investigations Report 2012-5282: Hydrogeology of the Susquehanna River Valley-Fill Aquifer System and Adjacent Areas in Eastern Broome and Southeastern Chenango Counties, New York. The hydrogeology of the valley-fill aquifer system along a 32-mile reach of the Susquehanna River valley and adjacent areas was evaluated in eastern Broome and southeastern Chenango Counties, New York. The surficial geology, inferred ice-marginal positions, and distribution of stratified-drift aquifers were mapped from existing data. Ice-marginal positions, which represent pauses in the retreat of glacial ice from the region, favored the accumulation of coarse-grained deposits whereas more steady or rapid ice retreat between these positions favored deposition of fine-grained lacustrine deposits with limited coarse-grained deposits at depth. Unconfined aquifers with thick saturated coarse-grained deposits are the most favorable settings for water-resource development, and three several-mile-long sections of valley were identified (mostly in Broome County) as potentially favorable: (1) the southernmost valley section, which extends from the New York–Pennsylvania border to about 1 mile north of South Windsor, (2) the valley section that rounds the west side of the umlaufberg (an isolated bedrock hill within a valley) north of Windsor, and (3) the east–west valley section at the Broome County–Chenango County border from Nineveh to East of Bettsburg (including the lower reach of the Cornell Brook valley). Fine-grained lacustrine deposits form extensive confining units between the unconfined areas, and the water-resource potential of confined aquifers is largely untested. Recharge, or replenishment, of these aquifers is dependent not only on infiltration of precipitation directly on unconfined aquifers, but perhaps more so from precipitation that falls in adjacent upland areas. Surface runoff and shallow groundwater from the valley walls flow downslope and recharge valley aquifers. Tributary streams that drain upland areas lose flow as they enter main valleys on permeable alluvial fans. This infiltrating water also recharges valley aquifers. Current (2012) use of water resources in the area is primarily through domestic wells, most of which are completed in fractured bedrock in upland areas. A few villages in the Susquehanna River valley have supply wells that draw water from beneath alluvial fans and near the Susquehanna River, which is a large potential source of water from induced infiltration. Well data for Susquehanna River valley and adjacent uplands, eastern Broome and southeastern Chenango Counties, New York. What the USGS are saying is that these three regions/locations are prime for “developers” (AKA drillers) to sink MAJOR water wells to supply frack operations. This paper relates to what I heard a Senior SRBS scientist present last year, that SRBC was quite concerned that as gas drilling moved North from PA it would be getting to the “headwaters regions (low water volume) of the Susq and other rivers and thus they anticipated more emphasis by the drillers to use groundwater for their fracking uses. This directly goes to the issue of impacts on water quantity of residential and public water wells; that is what will a big mother of a “comercial” well by a driller do to the QUANTITY of water available from your private well. In other words, will your water well dry up? 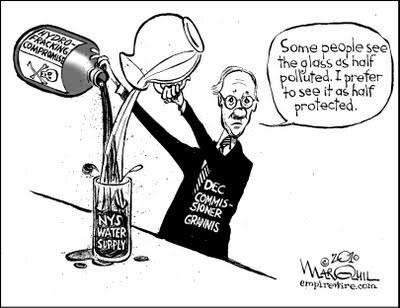 This is an issue that is NOT adressed at all in NYS draft regs OR the rdSGEIS – only pre-drill baseline testing of wells near(1000ft) a proposed well pad need be tested by the driller for QUALITY. The potential impact on private property values is clear; mitigation by drilling a private well deeper would probably work, although I dont know enoug hydrology to float a boat, so to speak. Finally, this water source/quantity issue will apply equally to regions further north of the NY/PA border, and one hope USGS is studying such; remember, drilling a bit north likely wont be marcellus but rather the deeper Utica Shale. 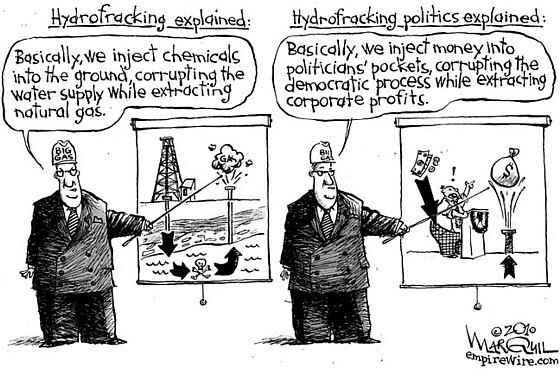 Fracking Has the USGS Been Co-opted? 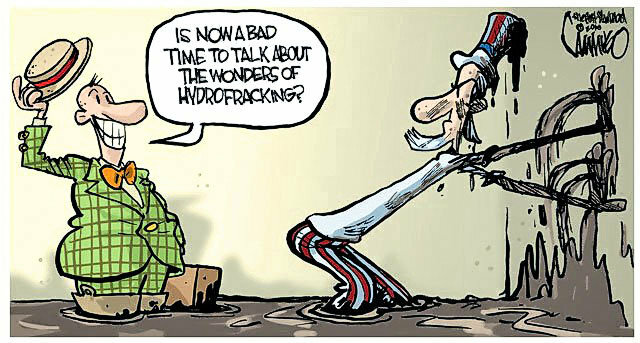 RWMA Newsletter – Fracking Special Edition 2012. Has the USGS Been Co-opted? Increased demands for cleaner burning energy, coupled with the relatively recent technological advances in accessing unconventional hydrocarbon-rich geologic formations, led to an intense effort to find and extract natural gas from various underground sources around the country. One of these sources, the Marcellus Shale, located in the Allegheny Plateau, is undergoing extensive drilling and production. The technology used to extract gas in the Marcellus Shale is known as hydraulic fracturing and has garnered much attention because of its use of large amounts of fresh water, its use of proprietary fluids for the hydraulic-fracturing process, its potential to release contaminants into the environment, and its potential effect on water resources. Nonetheless, development of natural gas extraction wells in the Marcellus Shale is only part of the overall natural gas story in the area of Pennsylvania. Coalbed methane, which is sometimes extracted using the same technique, is often located in the same general area as the Marcellus Shale and is frequently developed in clusters across the landscape. The combined effects of these two natural gas extraction methods create potentially serious patterns of disturbance on the landscape. This document quantifies the landscape changes and consequences of natural gas extraction for Bradford County and Washington County, Pennsylvania, between 2004 and 2010. Patterns of landscape disturbance related to natural gas extraction activities were collected and digitized using National Agriculture Imagery Program (NAIP) imagery for 2004, 2005/2006, 2008, and 2010. The disturbance patterns were then used to measure changes in land cover and land use using the National Land Cover Database (NLCD) of 2001. A series of landscape metrics is used to quantify these changes and are included in this publication.